AP-GTR2000GD embedded NTP server transmits GPS time information to network based application server which requires accurate time information via ethernet port. In local area network, this device transmits GPS based time information to application server like as CCTV recording serverby using NTP protocol. Without GPS based time synchronization or NTP server, if time is passed after installation or in service, each application server’s time clock is mismatched comparing with GPS based real-time. Especially, in case of CCTV application, time mismatching should be solved between real-time and CCTV application server’s current time. AP-GTR2000GD provides easy system cabling and Installation service by using gigabit LAN interface and internal GPS time receive hardware module. In front of AP-GTR2000GD, there are LCD display for GPS time information and blue LAMP for device status. Also, there are two(2) gigabit ethernet port and console port. At the rear of AP-GTR2000GD, there is one module slot for AP-GPSR2 module. AP-GPSR2 module provides dual DB-9 RS232 interface port and GPS antenna interface port. And, AP-GTR2000GD provides the dual power supply by using SMPS power for redundancy and stability. AddPac network products are well recognized in terms of performance and stability in the world. 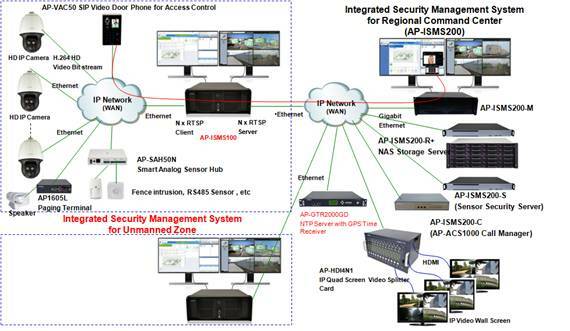 With our accumulated experience in enterprise market and communication market, AP-GTR2000GD embedded NTP server with internal GPS time receiver hardware module will satisfy the needs of customer along with AddPac CCTV VMS solution. Web Page Link -> AP-GTR2000GD Web Page.